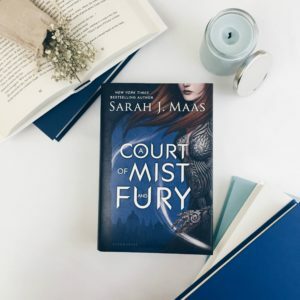 A Court of Mist and Fury was my most anticipated release of 2016 – and it didn’t disappoint. I will say what I thought I knew, and what I thought I wanted to happen, was not the case, at all, by the end of the book. By the middle of the book, my feelings were completely changed. The second I started to read the book I was bombarded with emotions. There was so much despair inside Feyre that I was overwrought with sadness. The consequences of her actions for saving Tamlin and his people in A Court of Thorns and Roses wreaked havoc on her and it showed. I was worried Feyre was going to be a broken shell of the girl she once was, but that wasn’t the case. In fact, by the end of the book, I was so impressed with her growth. She definitely wasn’t the girl from book one. She was stronger, more independent, and more sure of herself. Tamlin is the character I ended up the most disappointed in. I felt such anger because of his actions throughout the parts of the book he was in. He wasn’t in a large chunk of the book (thank goodness), but every time he showed up I was disappointed in everything he did. It is a crappy feeling when you think you know a character, but then you realize you were just being blind. I will never forgive him for the things he did nor will I ever see him in the light I once did. Rhysand. Oh boy, Rhysand. Now there is a character that brought the most emotions. Happiness, sadness, lust – lots of lust. He understood Feyre on a level that filled my heart with so much joy. He showered her with respect and understanding and they worked together amazingly well. I was excited for the introduction of new characters that I instantly fell in love with. Cassian, Azriel, Amren, and Mor. They were all great characters that I’m glad Maas provided a background story for. I was able to get a true sense of their character and feel for them in a way I sometimes have a hard time doing when it comes to secondary characters. Okay, now the ending. Wow! I seriously wanted to lay down and roll around after I closed the book. It was the most epic ending I have read in a very long time! I just know the last book in this series is going to be intense and I’m going to love every moment of it. I didn’t see that ending coming. I wouldn’t call it a cliffhanger, as I felt like there was some closure, but there was a huge “oh crap, stuff is going to go down in the next book!” feeling at the end. I am happily waiting for the last book even though I know it might be awhile. Yes! I agree!! The end killed me but in a good way! And oh Tamlin!!! I had so much love for him that I was blinded. I think we all were!!! The amount of feminism shown in this book was so inspiring!